Bold and the Beautiful spoilers show Wyatt Spencer (Darin Brooks) and Sally Spectra (Courtney Hope) celebrate the return of Spectra Fashions. Finally, it looks like Wyatt and Sally begin to work together on the new line, putting their expertise to good use. However, now that the two are more deeply involved in business and pleasure, could their relationship suffer? Finally, it looks like Spectra Fashions, Sally Spectra’s family legacy brand, is returning. According to new B&B spoilers, Wyatt is the one who fights for the line to come back to life. Of course, as he wants what is best for his girlfriend Sally, that means trying to restore her family brand. According to recent Bold and the Beautiful spoilers, Bill Spencer (Don Diamont) wants Wyatt Spencer back at Spencer Publications. However, Wyatt won’t come back unless Bill does one little thing. And that one little thing is to revive Spectra Fashions. Of course, Bill reneged on promises to help Sally before. As Wyatt heads back to work with his dad, Sally Spectra gets to work on her fashion line yet again. The duo ends up celebrating together as the clothing line is officially revived. Sally has Wyatt and (surprisingly, considering their history) Bill. However, will everything be sunshine and roses now that Sally’s line is back up and running? Previous Bold and the Beautiful spoilers hinted Sally and Wyatt might use their skills to potentially go into business together. Many fans thought this would lead to them starting a new fashion house together. However, now it looks like the two work together to breathe new life into Spectra Fashions. Sally and Wyatt — AKA “Wally” for fans of the couple — are stronger than ever. The two don’t have nearly as much drama as other couples on the show. However, things could change for them now that the Spectra brand returns. While the two obviously love each other, their new career responsibilities could put them at odds. The couple more than likely can work through any issues that arise from this relaunch. Any problems related to their exes, on the other hand, might not be so easy to deal with on Bold and the Beautiful. Both Wyatt and Sally Spectra may have some ex drama in the very near future. First, there’s Katie Logan (Heather Tom). Katie and Thorne Forrester’s (Ingo Rademacher) marriage is falling apart so Katie may soon be single and looking for a shoulder to cry on. In fact, she heads straight to Wyatt to confide what Thorne did to her on Valentine’s Day. Then again, Katie and Bill might be more inclined to get back together, rather than she and Wyatt Spencer. But Katie could flirt with Wyatt and potentially create havoc in his relationship with Sally Spectra. Plus, Katie isn’t the only ex who could come between the duo on Bold and the Beautiful. Thomas Forrester (Matthew Atkinson) is also heading back to town, potentially ready to sweep Sally off of her feet. The hunk is a serious temptation for Sally, so it may be a challenge for Wyatt Spencer and Sally Spectra to survive Katie’s heartbreak and Thomas’ return in coming days while also working together to bring back Spectra Fashions. Soap Dirt is the best source for all the Bold and the Beautiful spoilers. ← ‘Days of Our Lives’ Spoilers: Marlena vs Leo – Con Man Throws Paternity Truth In Her Face? 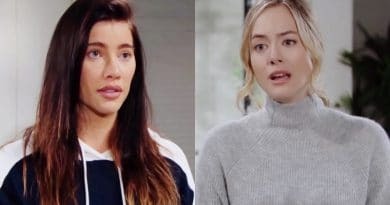 ‘Bold and the Beautiful’ Spoilers: Steffy Flees With Daughters – Hope’s Crazy Plan Too Much?